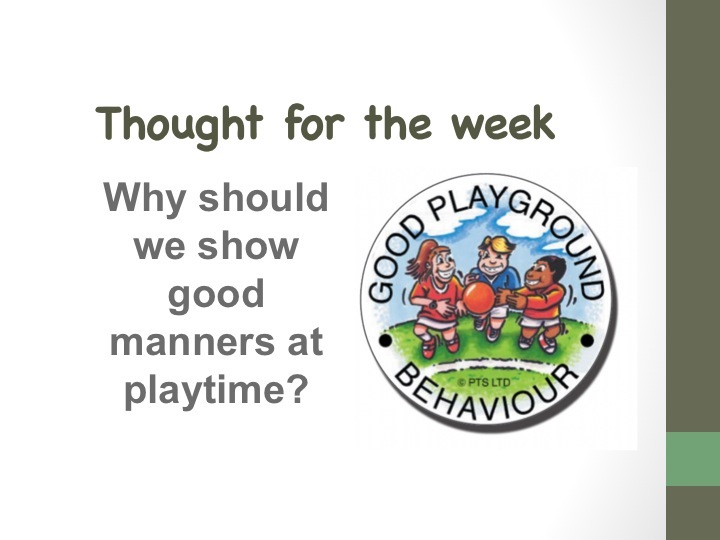 Thought for the week: Why do we need good manners in the playground? Because if people don’t show good manners children won’t be there friends. If you don’t show good manners in the playground then no one will want to play with you ,because of the way you act and talk. We have good maners at playtime because if you don’t you will be left alone with no one to play with. You need to have manners in the playground because you could have more friends and if you don’t have manners you could also have no friends . If you have good manners people will be friends with you. if you didn’t do something nice to some one then you wouldn’t show good manners. If you show the, good manners they will be nice to you too. If your nice to people in the playground you will have lots of friends. when somebody is walking and they say “get out of ,y way” that’s rude. You should say “excuse me” instead because it is not rude. Being polite makes people like people. I have so many friends in my life because I have been nice to them. Everybody in my class. when someone is being nice to you and asks to play with you and says yes. That is being polite.